All kinds of customers come into the shop with all kinds of needs. But one prominent class of customer loves cycling, and always has, but can’t stand that bicycle any more. They are fit folks who ride hard on fast bikes. They often ride with other fit people and they want to keep up. What these people need are fast recumbent bikes. To get the highest top speed you need good aerodynamics. This means a reclined seat. This also helps when fighting the wind. If you want to cover lots of ground with the least energy, aerodynamics is your best bet. 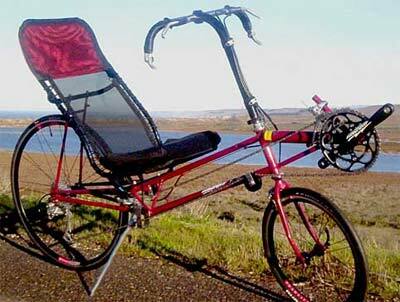 All recumbents are reclined, and more aero, compared to upright bikes. But the really reclined ones, or else the fully enclosed “streamliners” are the best at this. Another kind of fast is on climbs. If hills define your terrain then you probably want a good climber. This demands a more upright seat, with high cranks for leverage. If you need fast, jackrabbit starts then the upright seat is the way. Short wheelbase recumbent bikes are the fast ones. They are light and compact and handle like road bikes. Bacchetta’s Corsa and Aero models define the modern performance short wheelbase recumbent. Lightning’s P-38 is a classic design, dating back to the early days of recumbent production. The P-38 is still the best climber on the market. If you want a fast bike for practical use, the P-38 lends itself to that.